The same strategy is being used by Russia’s propaganda machine to shift the blame for the Mariupol massacre to the Ukrainian military. First, RT (formerly known as Russia Today) proudly broadcast an announcement by the terrorist leader of the self-proclaimed DNR (Donetsk National Republic), Alexander Zacharchenko. 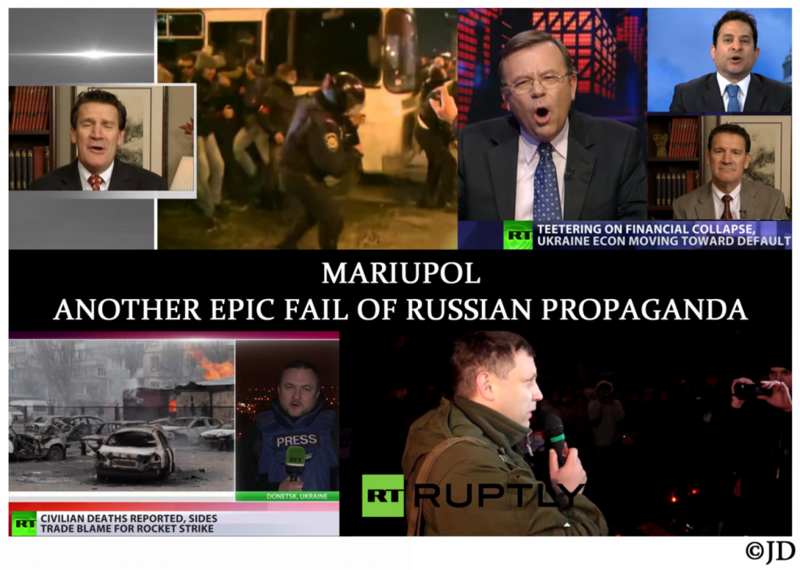 To the cheers of the crowd in a televised appearance, Zacharchenko exclaimed that the “rebels” have commenced an offensive, storming the city of Mariupol. These and other plans were published by Komsomolskaya Pravda just one day earlier. Separatist leader Pavel Gubarev boasted about the upcoming attacks of Mariupol and other cities on Jan. 23, 2015. Once it was revealed that the indiscriminate shelling caused the deaths of 29 civilians and one Ukrainian soldier, the Russian networks started to sing a different tune. They now claim that Ukrainian forces were behind the attacks and the “rebels” have no plans to storm Mariupol. The Organization for Security and Co-operation in Europe (OSCE) confirmed that the rockets came from the areas controlled by separatists. Ukraine’s security service (SBU) has published the recording of intercepted conversations between the “rebels” speaking about the Mariupol attack. While Russian propaganda is constantly debunked and invalidated, it still achieves its primary purpose. By sewing black seeds of deception, Kremlin’s mouthpieces create confusion and fabricate false moral equivalency between terrorists and their victims.